EVERY ACCOUNT ALSO INCLUDES OUR EASY TO USE CPANEL & WHM! cPanel and WHM (WebHost Manager) are the next generation in web hosting control panel systems. Both WHM & cPanel are extremely feature rich and include an easy to use web based Graphical User Interface. Web Host Manager puts you in charge! WHM allows you to administer each of your individual accounts. This includes adding / removing accounts, controlling disk space and bandwidth, resetting passwords, server stats and so much more! cPanel is designed for your clients in mind and allows them to control everything from adding / removing email accounts to administering MySQL databases to creating ftp accounts and even backup their site files all at the touch of a button! Web Host Manager (WHM) offers the most feature packed administration interface on the market. From Apache Administrator to Zend Optimizer Installation, WHM contains the features necessary to keep your hosting servers running and your customer base expanding. To help you understand how to use each cPanel and WHM feature, we provide step-by-step instructions, in-depth manuals and even tutorial videos for you to watch. These are all available in our support section. Here are some screenshots to show just how simple managing your websites can be! cPanel is the industry's leading web hosting account control panel. It is packed with features and fronted by an easy to use, clear and intuitive interface that makes even the most daunting of tasks a breeze  such as setting up e-mail accounts, creating databases and one-click script installations. RV SITE BUILDER IS AVAILABLE FOR YOU AND YOUR CLIENTS! RV Site Builder is available with this hosting plan! Resellers may allow/disallow RVSiteBuilder to their Clients in WHM. Our Web Site Builder is the perfect tool for building your website quickly, without investing in a webmaster or an expensive web development software package. Choose from a wide variety of professionally designed templates to get your site up within minutes. 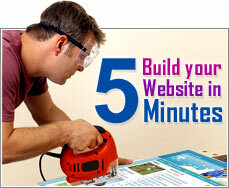 RVSiteBuilder is an advanced website builder. Easily create the website through the step by step navigator. First create the project, add the company name, web site title, upload logo, select the templates, tweak the template styles, choose the preferred navigator, create and manage page structure, edit the page with WYSIWYG html editor, add extra component, preview and publish the website. It is packed with over 300 colorful stylish templates, multiple page layouts and navigator styles. We are always adding new templates to the application in various categories such as business service, internet, beauty, health, and more. We use WYSIWYGPro as an online HTML editor. It supports all Internet Explorer versions 5.0+, and Netscape 7.1+, Mozilla 1.4+, Firefox 0.9+, or any other browser with an equivalent gecko layout engine on any platform where these browsers are available. This includes Macintosh and Linux. WHMCompleteSolution is the complete client management solution for Web Hosts & Dedicated Server Providers looking for Online Automated Recurring Billing, Flexible and Easy to Use Client Management and Integrated Client Support Center including Support Tickets, Knowledgebase, Announcements & Live Server Status. Order Form Demo: Click here! Integrated directly with the WHM and cPanel server management software, WHMCS can provide you with client management, billing & support, all integrated and can interface with accounts on multiple servers to create, suspend and terminate hosting and reseller accounts. But it doesn't stop there, WHMCS will not only allow you to sell hosting and reseller accounts, but it also fully supports the selling of VPS & Dedicated Servers & other products such as web design, SSL certificates, and much much more... The possibilities are endless! Automate the Account Creation & Setup process. Instantly Setup Accounts on Order or First Payment. Show Disk Space & Bandwidth Usage for Accounts. Show server usage % based on account limit. WHMCS automates client billing. Invoices are generated, payments are logged, reminders are sent - and did we mention it was all automated?!? With WHMCS, the worries and time spent dealing with billing are gone leaving more time for the important things. WHMCS is a powerful integrated client management, billing & support system. It provides everything you need to manage your clients. Packed with features while remaining easy to use, we've tried to highlight what we feel are the most important features below. WHMCS supports Hosting, Reseller, Dedicated Server, Downloadable & Other Non Hosting Related Products. Each product can have custom fields, configurable options, addons, downloadable files and custom welcome emails specific to that individual product. You can also create one off invoices with custom line items - ideal for service invoicing. WHMCS can communicate with your servers and domain registrars to automatically provision accounts, register/transfer domains, suspend, unsuspend and terminate services, renew domains, update nameservers, modify whois contact information, upgrade/downgrade packages and more. Also supports server rotation and multiple active registrars concurrently. All clients need support and WHMCS gives you the tools you need to provide it. It features an announcements section, knowledgebase, downloads and support ticket system. The ticket system can handle both registered and unregistered clients, has full email piping and multi-department support with admin assignment. In WHMCS, each of your clients has their own profile section. This contains all their personal information, products/services, domains, invoices, transactions, email history and notes. You can see statistics about the client and manage their details from there including editing when and how much they are due to pay, payment methods and adding notes. WHMCS comes integrated with many payment gateways and will automatically charge clients credit cards when due. All payments are logged in the system, invoices can be paid using multiple partial payments, clients are credited on overpayment and credit is automatically applied to future invoices. Reminders are sent before payments are due and after. Unique to WHMCS is it's client area. The client area gives clients one single central access point to manage their account with you, request support, place orders, view announcements and more... It also offers features for non-registered visitors, with a domain checker, server status summary, downloads and browsable knowledgebase. Also has multi-language support. The client area is fully templated and unlike some systems, you don't need a degree in programming to be able to edit them! There is no PHP code in the templates - it's just regular HTML which you can edit in your favorite editor. WHMCS also has an API which allows you to connect with it from other systems and the modular design lets you add what you need. We Have Combined cPanel/WHM + RV Skin + Fantastico To Bring You & Your Clients The #1 Control Panel! CPanel is a next generation web hosting control panel system. CPanel is extremely feature rich as well as include an easy to use web based interface. RV Skin interface makes it easier for you to manage all aspects of email, files, statistics, scripts, and many more. Fantastico is a script installation module that allow you to install over 45 scripts with just a click of a button. The combination of CPanel, RV Skin and Fantastico makes our control panel the #1 in the industry. RVskin will allow you and your clients to have a choice of different themes and more than 20 languages! You can switch between languages and/or color themes by using the icon in the control panel. 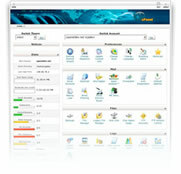 RVskin is an advanced multi-language and theme management software for cPanel. Multi-language support will allow you to sell to ANYONE, Regardless of what language they speak! FREE RESELLER WEBSITE OF YOUR CHOICE! THIS Auction INCLUDES 1 FREE Turnkey Pre-Made Reseller Website of YOUR CHOICE! We wanted to make reseller hosting as easy as possible. One of the hardest parts of becoming a reseller is creating your web site design and content. That is why we have created about a dozen web hosting designs along with content already written. Upon payment for your account, You will get 1 FREE website. Website comes paypal integrated so you can easily accept payments. Includes a simple admin panel that makes quick modifications a breeze! FREE Domain Reseller Account is also included! We also offer all clients a free Domain Reseller account to use along with your Hosting Reseller account. This offer entitles you to a free domain reseller account with no signup fees and no minimum deposit. You can start reselling domains immediately after signup for the domain reseller account! This extra usually costs thousands of dollars when purchased directly from a domain register. However, when you purchase our reseller plan we will provide it as an extra that is absolutely free of charge! It will allow you to sell domain names to your clients at below wholesale prices! The domain reseller account also integrates with the optional billing system (whmcs) to automate the domain registration on new orders making even less work for you! Details for the domain reseller account will be provided upon signing up for your reseller hosting account!